The beautiful town of St. Marys is on the Kansas River and marks the earliest point settled by white men in Pottawatomie County. In 1848, the Jesuit fathers, chief among who were Rev. Morris Gailland, Rev. J.B. Hoeken and Rev. Father Va Wright, established a mission at what is now the town of St. Marys, for the purpose of educating the Indians so as to bring them to the knowledge of Christianity. Benjamin H. Bertrand and his brother Joseph, who were Catholics, worked with the priests for the initial movement for the foundation of an institution known as St. Mary's College. The Mission School for the Pottawatomie started in 1848 and lasted until 1869 until the college became chartered. By 1882, it was one of the most attractive places for student life that could be found in the west. 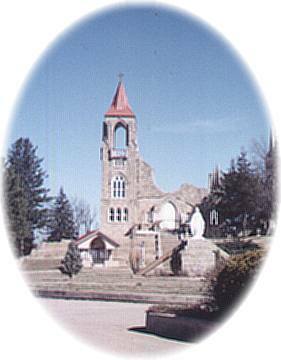 St. Marys was laid out as a town by B.H. Bertrand, August 8, 1866. Three land additions were made by 1870. This unique sculpture depicts the Pottawatomie Indians, the Mission and the Oregon Trail. It can be seen on the north side of Highway 24 in the center of town.